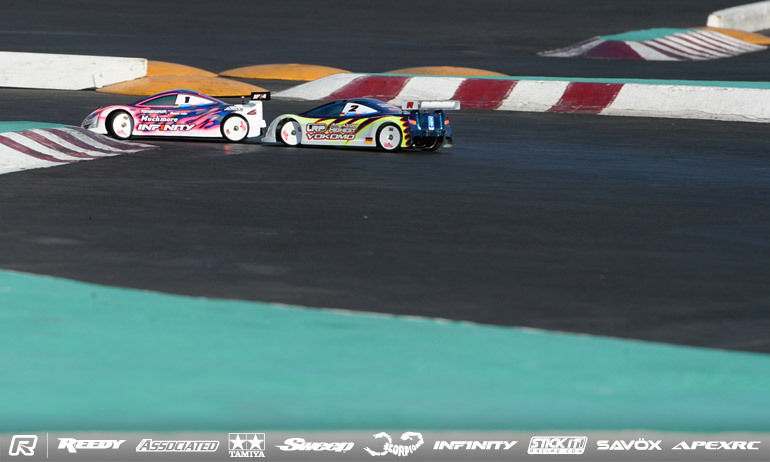 Ronald Volker and Akio Sobue completed the podium at the 21st running of the Reedy Race of Champions, both drivers registering wins in the 12th and final round of racing at the legendary race’s final farewell to the Tamiya Raceway track. With Marc Rheinard wrapping up his 7th Reedy Race title with a win in the penultimate round of racing, the final series of races was about deciding the podium with the first race up the important one in the fight for 3rd. Contenders Sobue, Viktor Wilck and Christopher Krapp lined up together with Wilck also having an outside chance of taking second overall from Volker but his main focus was on keeping the final podium position he had held all day. Starting on the front row, Sobue got the perfect start to take the lead and while Wilck tried to chase him down he couldn’t get by the Infinity driver. With Krapp having a rough race behind them, Akio would get the win snatching 3rd overall from Wilck on tiebreak. With that position settled, the final race would see Volker and Rheinard line-up on the same grid and having duelled it out for the win all weekend until Volker suffered a DNF this morning, it would be a fitting end to the event as the pair but on a world class duel that highlight exactly why the Tamiya track has been such a hit with drivers. Coming through the field, they battled over the win with Volker putting a great pass on Rheinard even complimenting his rival afterwards on his ‘nice move’ on him. 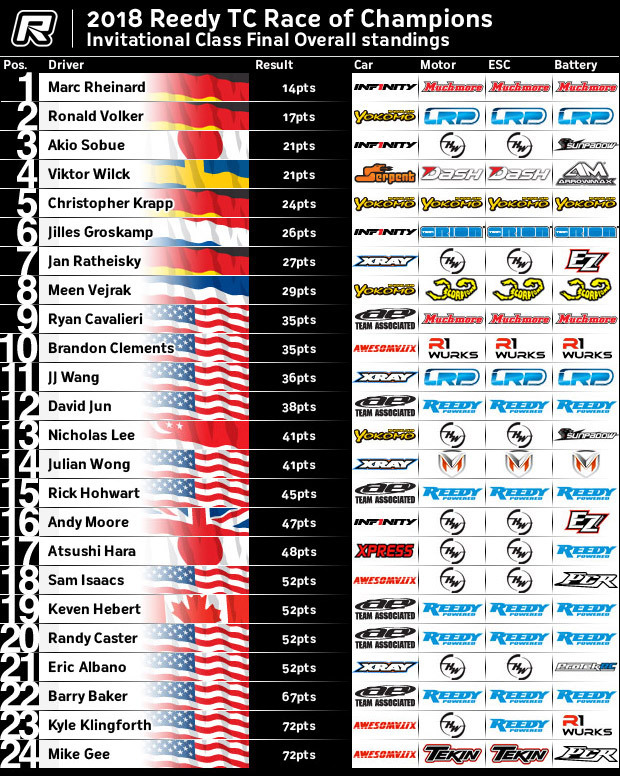 While Rheinard will go down as the last driver to win the Reedy Race at the Tamiya track, Volker has the claim of winning the last ever race. ‘That was a perfect finish to the event’, was Rheinard’s reaction to his battle with Volker. He continued, ‘Ronald made a mistake and I got by and then somehow we both got to the front. It was a good fight and it was a nice move he made on me’. With Rheinard rolling as they touched he said, ‘it was definitely fair and a perfect way to sign off racing at this track. I took the overall win and he took the last race win so we both have a special memory of the track’. Asked about the race, Volker diverged for a moment saying, ‘I’m more sad at realising during Scotty’s (Ernst) speech that this is the last time here. This was one of my first overseas races I made and I always loved it here and the track’. 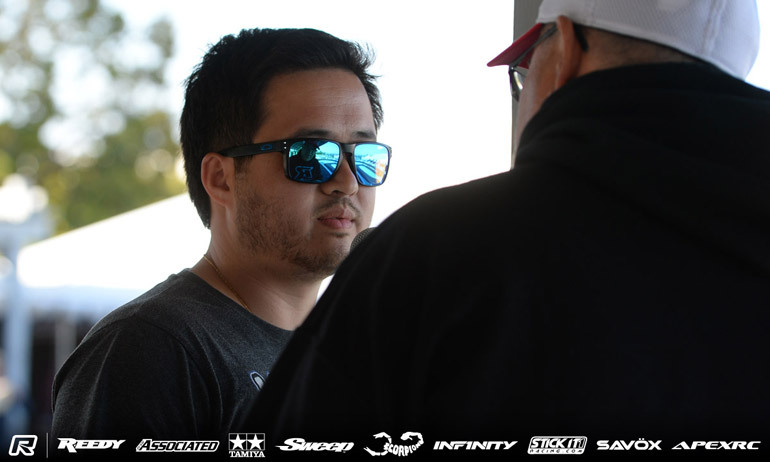 Coming back to the race, the Yokomo driver who started 6th said, ‘I was staying patient behind the others and then tried to set-up a pass but Marc went by. Then we ended up toe to toe in P1 and 2. I enjoyed that round a lot, it was the first time this year we had that situation. Considering I was not able to win because I had 3 bad runs today I am satisfied with the win and the pass’. 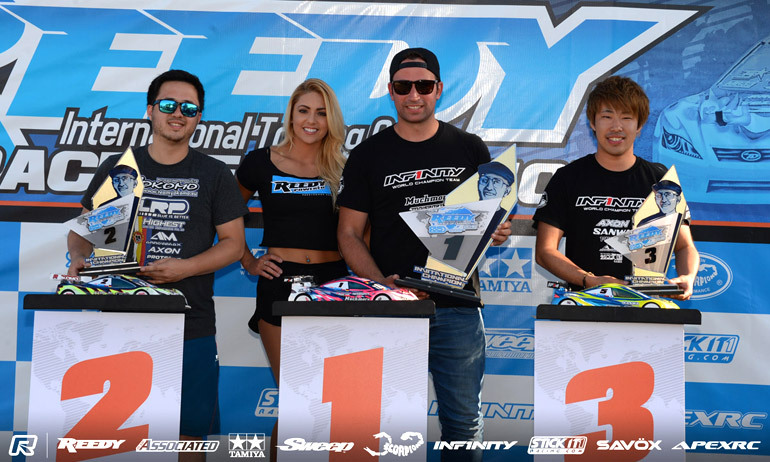 Claiming his first Reedy Race podium at Tamiya Raceway, but his second podium having previously done so at Norcal, Sobue was happy with his event saying, ‘today was a good comeback after a bad day yesterday, 3 wins and one second was a good day for me’. 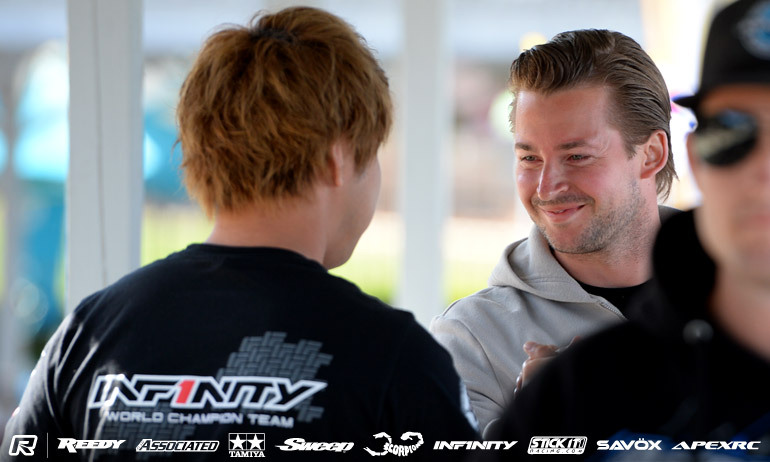 The Infinity driver continued, ‘I have to congratulate my team-mate for his win, he is the best Reedy Race driver’. Summing up his fourth place overall, Wilck said, ‘Ahh, a bummer. I knew I had to beat Akio to be on the podium. He got by Julian (Wong) at the start so I didn’t he didn’t hold him up at the start and he drove without mistakes so I couldn’t get hold of him to attack’. The Serpent continued, ‘that’s racing. I was third last year tied on points and this year I’m fourth tied on points’. Behind the Swede, Krapp would finish 5th with Jilles Groskamp completing the Top 6 of the 24 invited drivers. 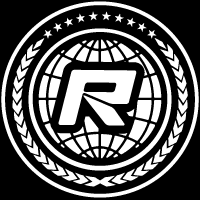 While no new or temporary home has been decided yet for the next Reedy Race of Champions, one driver who will be invited to race the with the best drivers in the World is Gonzalo Cortes. 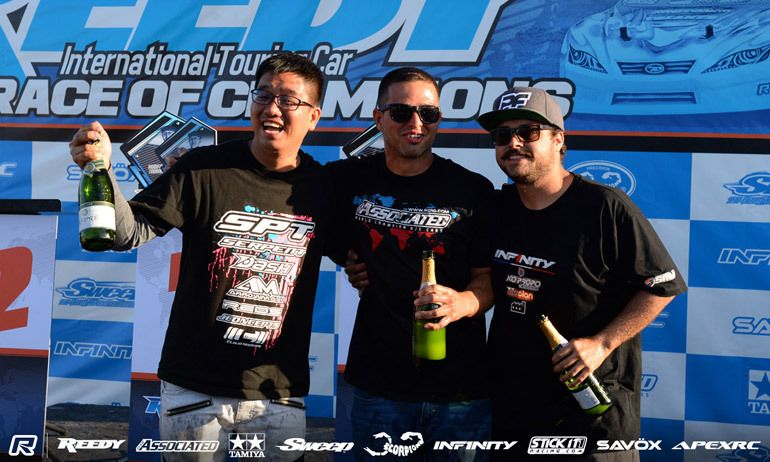 Taking the TQ in the Open class, the Team Associated driver won the opening two A-Mains to secure the overall win with victory in A3 giving the Serpent of former Open Champion Felix Law second while Christian Lopez completed the podium. In the the other two classes, Eric Anderson took the 17.5 Stock Expert win for Awesomatix while German visitor Thomas Oehler took his ARC to victory in the 17.5 Stock Sportman class. View our complete event gallery here.